"The bamboo mat is one of the more common symbols of sushi making. However, as you will learn below you can easily make sushi without it." A makisu or bamboo mat is a mat woven from bamboo and cotton string which is used in food preparation. Makisus are mostly used to make makizushi a kind of rolled sushi, but are also used to shape other soft foods, and to squeeze excess liquid out of food. The bamboo mat is usually 25 cm x 25 cm, but can equally vary. 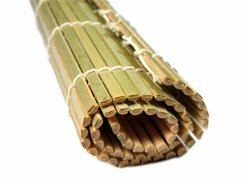 It comes in two variations and in various sizes, one with flat thick bamboo strips and the other with cylindrical thin bamboo strips. The flat thick bamboo mat is considered more versatile and is used for thicker sushi rolls while the cylindrical flat thin mat is designed specifically for makizushi. While using the bamboo sushi mat, some people cover them with plastic film to reduce the cleaning effort. This is especially done while producing uramaki, a kind of maki sushi with the rice on the outside of the roll. It is advisable that a bamboo mat be air-dried after, so as to avoid the growth of bacteria and fungi. Alternatively, sushi mats can also be disposed after usage. These days sushi has become a recognised part of menus in many homes and restaurants across the world, therefore owing a sushi mat has become a necessity for those concerned. Sushi mats are inexpensive and can be afforded by anyone who needs them.making it, as well as touching and shaping once rolled. When used to make an inside out roll, the mat needs to be wrapped with saran tape in order to keep the rice from sticking to the mat. This may also be applied while making a maki roll to make the mat easier to clean during the process. The mat itself should be kept dry, and never put into a dish washer. That is unless you are using a silicon sushi mat. If you are rolling together, you might want to have more than one mat in the house. How to pick a sushi rolling mat ? There are two kinds of bamboo rolling mats on the market. First you have the cheap kind, where both sides of the mat are rounded. That’s bad. The second kind, might cost you a buck more, and features the “top of the line” of western technology: one side is rounded and the other is flat. You will soon find out that a rolling mat with one side flat is a lot easier to use, and brings you much more impressive results. So is it just bamboo then? Nope. Some folks prefer using a silicon mat for sushi. One of the advantages of silicon is that it’s easier to wash. If you have made sushi before you might have gotten grains of sushi rice in your bamboo mat and know how difficult that is to clean by hand. Silicon mats don’t have that classic feel to them, but they sure are easier to clean – just put it in your dish washer. If you are interested in one, do check out this offer. Can I make sushi without a mat? Although a bamboo mats make sushi making easier at least in the first few times – you can make your own maki and inside out sushi rolls with it. You can simply use your hands for the job. Some creative folks have found other substitutes. Check out the video below by Nicki Sizemore showing you how to roll your sushi with parchment paper instead of a bamboo mat. Where can I get a rolling mat? You can find a good value sushi rolling mat online (here), or at your local food store. Wow!The video explains more better. I can really understand now. Thanks! I will consider going for a bamboo mat since it makes sushi more easier. Thanks for the guide. Hi – What’s a good bamboo mat?